Once again, another treacherous journey getting to my next destination, Vienna. But one thing I’ve learned is that nothing really ever goes exactly according to plan, and sometimes you just have to wing it. So here’s my winging it in Austria! This post is going to be pretty short, just a warning! I had a train to catch at 8:40am, so I was up pretty early to catch it. I headed to the underground station, but it turned out that I left a bit too late. I arrived with just 12 minutes until my train departed! Ahh! After asking some friendly strangers for help, I was able to locate my train in the nick of time. Just 3 minutes after I stepped on board, the train rode away. Thank goodness I wasn’t 5 minutes later! I settled in for what I thought would be the better part of 4 hours. Next to me was a nice, Czech student named John. We chatted for a bit before I plugged in headphones and took a short nap. After about 2 hours, John got off the train, and the conductor came over to speak to me. He started talking in Czech, and then switched to English when he saw my confused look. He asked me where I was going. “Vienna,” I replied. He then said to me, “Okay, well this train is ending at the next stop, so you need to get off and switch trains.” I was very confused, as I had booked a direct train, but he said everyone had to get off, but that the new train would be on the exact same platform, the same seats, and would come about 10 minutes later. Well, over 20 minutes went by before another train came. I was standing on the freezing platform, worried that I wouldn’t get on in time. Finally, a train came up, but it had a different destination on it. I walked over to a conductor, and explained my situation calmly. He then shrugged his shoulders and responded in Czech. I then said the simple word, “Vienna?” and he was STILL confused. I pointed to my ticket and tried a third time, “Wien?” (Vienna in German). Finally, he said, “Wien! Yes!” so I hopped on board. You would think that the conductors would speak English. Or at least attempt to understand me. Ugh. I got on the train for the next hour and a half, and arrived in Vienna with no additional problems with transportation. I got a bit disoriented when I got off the underground to find my hostel, but I made it in one piece, and just in time to check in. Here’s where things got complicated again. The original room I was placed in was full, so I headed back downstairs to be reassigned. The woman at the desk apologized and assigned me a new room. The second I walked into the new room, I was overwhelmed with the smell of cigarettes. There were butts all over the floor, and even cups with someone’s black spit. I stood there for 30 seconds before storming out and back to the lobby. It was absolutely disgusting. The woman was so shocked to see me again. Luckily, there was another room available, and this time she personally escorted me there. With 2 beds available and no cigarettes in sight, I was finally able to put down my luggage and relax. It had been 7 hours from the time I left my hostel in Prague to the time I arrived at room #3 in Vienna. I was so exhausted that I took a quick nap. I felt a little bad for not wanting to check out the city, but I had 2 whole days left, and figured it would be okay. When I woke up, I was really hungry, so I asked the lobby where to get the best schnitzel, something Vienna is famous for. She directed me to 2 different places about a mile’s walk away. So I bundled up and headed out. The city was absolutely beautiful! I couldn’t wait to see it during the day! Place #1 was packed, but luckily the second place was 5 minutes away. I waited in line for about 20 minutes before being able to be seated. There was a sign on the door that said “best schnitzel in Vienna,” so I had a feeling I was in a good place! After sitting down, I ordered their schnitzel and a side of potato salad, as the waiter said it was delicious. 15 minutes later, a monstrosity is placed in front of me. Everything was delicious, but it was such a ridiculous amount of food. I ate about half of it before realizing that I also wanted dessert. Obviously I needed to pace myself. 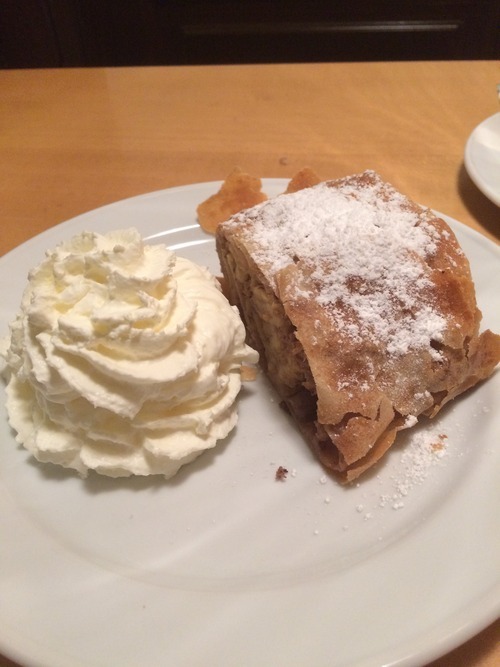 I ordered an apple strudel, which was equally delicious but also massive. With these portion sizes, I honestly thought I was back in the United States! But everything was so good. Couldn’t finish the strudel though. I paid the bill and walked off my food on the mile walk back. I headed straight to sleep. Well deserved, if you ask me! Sorry this post was pretty short and very rant-y, but that was day 1 in Vienna! Day 2 is coming up soon.